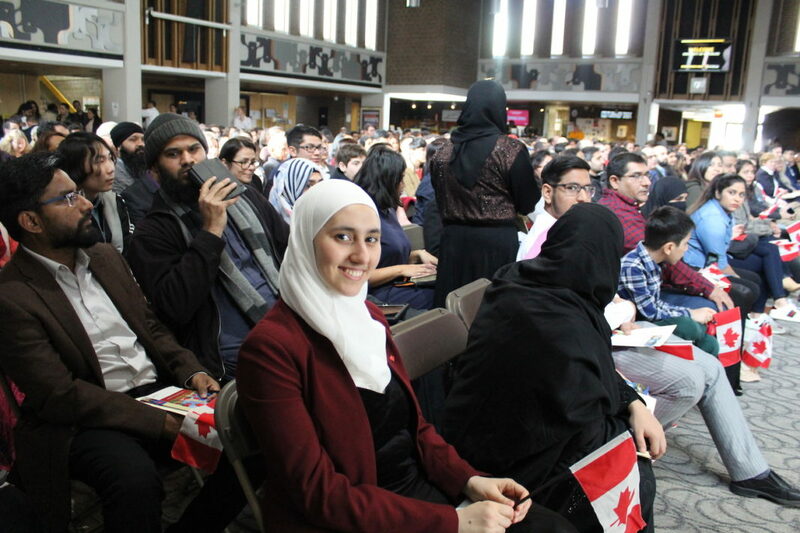 Rahaf Alnouri, from Syria, participated in the Canadian citizenship ceremony in the SLC on Friday morning. Reciting the Canadian citizenship oath of allegiance was a bittersweet moment for Saravanan Manoharan. “India doesn’t offer dual citizenship and my family is still there, so it feels like I’m giving something up, but I know I’m gaining something more. It’s just not a decision I took lightly,” he said. Manoharan, who moved here in 2005 to attend Mohawk College, was one of 200 people from 44 countries sworn in as Canadian citizens in the University of Waterloo’s Student Life Centre (SLC) on Mar. 29. He, like many of the new citizens, have lived in the area for more than five years and already feel just as at home in Ontario as they had in their home countries. Valentina Acuna and her parents, Orlando Acuna and Luz Gutierrez, moved to Canada seven years ago after her family received death threats. Valentina is currently a student at the University of Ottawa and can’t picture ever permanently residing anywhere else. Citizenship judge Albert Wong presided over the ceremony and told the crowd of new citizens that he understood the sacrifices and challenges that many of them have had to face in their journey to Canada and thanked them for their perseverance. “Many of you have made this journey with your children in mind. It is the children who stand to gain the most. You hope to see them excel in all that they do, but also hope they excel in the arts because it is through the arts [that] we can share our cultures together … the arts infuse a community spirit as well,” he said. Wong said that, as Canadian citizens, people will enjoy many rights and also many responsibilities. “It has been emphasized this morning the equal rights between men and women in Canada,” he said. He asked that each new citizen consider volunteering for a cause in their community to help learn from and teach others. More than 500 people filled the Lower Atrium after the ceremony to speak with judges and delegates, including Rahaf Alnouri, who moved to the area from Syria almost five years ago and beamed with pride.